Karnataka are very pleased to announce the release of their new studio album Secrets Of Angels in February 2015. Recorded at Real World Studios, Box, Wiltshire and Quadra Studios in London, the new album features 8 stunning new tracks including the 21 minute opus and title track Secrets Of Angels. The album features guest musicians Troy Donockley from Nightwish ( Uilleann pipes and low whistles), Irish harpist Seána Davey, Rachel van der Tang (cello) and Clive Howard (viola) from the Royal Philharmonic Orchestra. 1CD Standard Edition: including 20 page booklet. 1CD/ 1DVD Special Digipak Edition: Secrets of Angels CD complete with bonus DVD which includes behind the scenes footage from the album recording at Real World and Quadra Studios, previosuly unreleased live footage and image galleries. The first 500 will be signed. Further dates may be added - please check the website for updates. The band have launched a brand new website. The new site features a fully responsive design to work on all media platforms. 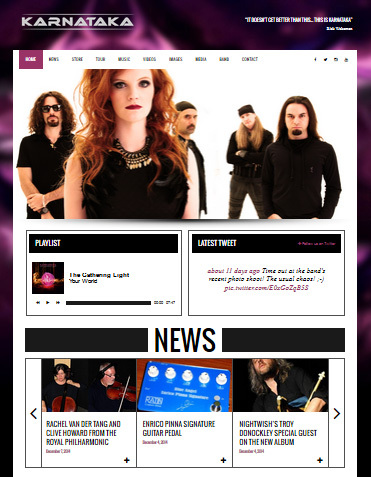 The site also features a comprehensive band history including some band pre-history! The band would like to wish everyone a very Merry Christmas and thank you all for your support this year! Look forward to bringing you the new album soon and hopefully seeing many of you on the road in 2015!